Maps offer a panoramic 360° photo (https://goo.gl/goe6o8), but the historical feeling cannot be captured on a photo. The castle was built in the 13th century and it belonged to the system of border castles, providing security to the roads from Morava to the Carpathian passes. The castle is divided into two parts – the lower castle and the middle castle separated by a dry ditch. Part of the ditch was covered when the upper and middle castles fell down. The main entrance to the lower castle is on the eastern side. As the castle stood on a rather well-accessible hill, its defence had been constantly improved. The entrance to the castle was guarded by two bastions of the outer fortifications. Opposite the main entrance is the 3/4-circle cannon turret of the middle castle, protecting the entrance from the enemies through gun fire from hand guns and cannons. There are semi-circular fortified towers in four parts of the outer walls of the lower castle. The middle castle is divided into two parts in terms of functionality: the northern courtyard of the middle castle and the residential palace section. From the courtyard (next to the memorial), a staircase led to the atrium courtyard and the rooms. There were 40 rooms – 15 on the ground floor, 20 on the first floor and 5 on the second floor. A well was located on the western courtyard of the lower castle (near the memorial). An older well was located also on the middle castle courtyard (near one of the accessible rooms). The castle was built by magister Aba from Hlohovec in the 13th century. In the following years, the castle had seen 40 owners until it became property of Francis Nyáry in the 16th century. The last members of the Nyáry dynasty eventually built a new castle on the square in Sobotište and gradually moved there. The castle was abandoned and started to dilapidate. The unguarded castle was burned by the Turks in the 17th century, with only the remnants of the walls and several parts of the middle and lower castle still standing. The castle is accessible year-round. Entry fees are collected at the entrance from April to October, the resources are used for the maintenance and renovation of the ruins. 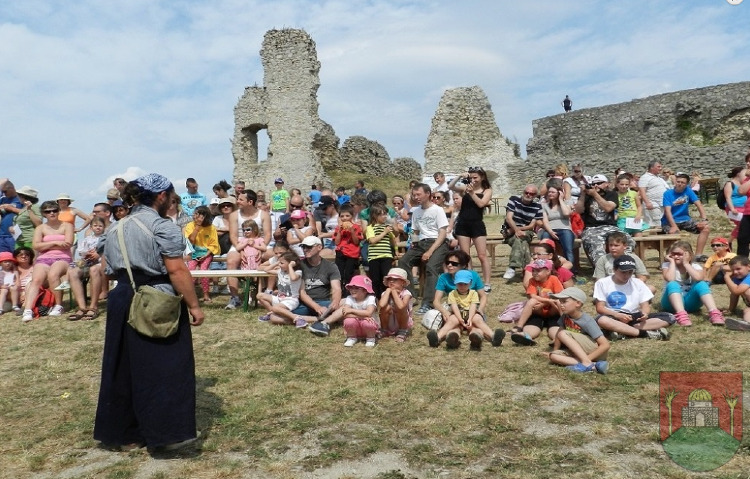 Every year, Castle days are organized by the village Podbranč, attracting hundreds of visitors thanks to its cultural, sports and entertainment programme. Legend has it that the workers building the castle were once approached by a beggar, asking them for a piece of bread. They were too parsimonious to give him even a piece, laughed at him and set dogs onto him. That's when the beggar uttered his curse – Let the devil take the castle and turn every loaf of bread into stone! And so it happened – what the workers built during the day, someone demolished at night. The workers were scared and did not know what to do. Once some beggar told them to sprinkle the crumbs from the Christmas table over everything they had built. So they waited until Christmas, desperate and hungry, and did exactly what the mysterious beggar advised them to do. From that time on, no witchery happened anymore and they were able to finish the construction of the castle.